The American Cemetery Guadalcanal was located near slightly to the east and inland from Lunga Point near Henderson Field on the north coast of Guadalcanal. The American Cemetery Guadalcanal was known by many different names. Also known as the "Marine Cemetery at Lunga" "Lunga Cemetery", "Guadalcanal Cemetery" or "1st Marine Division Cemetery, Guadalcanal". Later, the cemetery also included a section for New Zealand personnel killed on Guadalcanal or in the Solomon Islands. 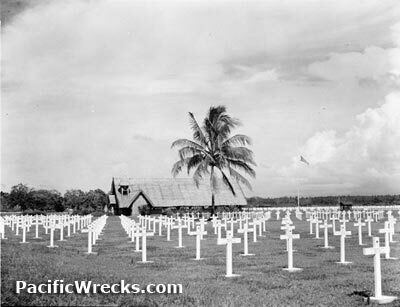 Postwar, also known as the "Army Navy, Marine Cemetery Guadalcanal". During the middle of 1942, the American Cemetery Guadalcanal was established a cemetery for American casualties from the Guadalcanal campaign. By 1943 the cemetery was further developed with a chapel made using local materials and a large cross, surrounded by machine gun bullets and 37mm shells. On September 17, 1943 First Lady Eleanor Roosevelt visited the cemetery during her day tour of Guadalcanal. She was photographed and recorded visiting several graves including Marine Cpl Stanley E. Friedrichs. After the war, every grave was exhumed and transported to Manila American Cemetery, National Memorial Cemetery of the Pacific (Punchbowl) or back to the United States for permanent internment. Afterwards, the cemetery was abandoned. The former location is about 500 yards inland from the coast near the Airport Motel. In 2003 during the Regional Assistance Mission to Solomon Islands (RAMSI), Australian personnel were based at the Airport Motel and located several gravestones from the former American Cemetery Guadalcanal. Although these were not in anyway associated with remains, they are interesting relics. American Battle Monuments Commission (ABMC) was alerted to their presence, but was uninterested in them. But, many of these concrete slabs were made by buddies or friends, and some quite elaborate in their sentiments or messages to the fallen.